of our Lord and Savior Jesus Christ! There is song that you hear sung quite often here in the U.S. around the time of Christmas titled “There’s No Place Like Home for the Holidays.” I think we can all relate to such a warm sentiment. It is nice to be in the warm, loving, caring, and familiar atmosphere of home and family for the celebration of Christmas. We appreciate having familiar traditions and loved ones surrounding us during this time of year. It is ironic, though, when you read the account of the Christmas Story in the Bible because it seems that NO ONE was at home that First Christmas…Mary and Joseph’s home was NAZARETH, and yet they were in BETHLEHEM…The Shepherds were AT WORK in the field that night…The Magi weren’t home either as they were TRAVELING to find the newborn King. Even JESUS was not at home! Jesus left his home in heaven as Scripture tells us: “The Word became flesh and dwelt among us.” Christmas truly reminds believers how far the love of God reaches. God became man and came to earth to be our brother. Only God given, saving faith can grasp this extraordinary truth. Human reason looks at this miracle and scoffs. 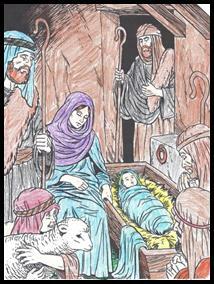 Earthly wisdom tries to find alternatives to the Christmas story. The old Adam tries to push Christ out of Christmas to make room for the materialistic side of Christmas that is promoted so heavily in a consumer driven, self-fish and self-centered society. But saving faith holds on to the promises given to us in Holy Scripture and celebrates the birth of the Savior! The virgin will be with child and give birth to a son…God promised through His prophet Isaiah. And God kept that promise when Mary (the virgin) conceived and bore the Son of God. And He dwelt among us…the very Son of God, the Word, made flesh! But the question is, why did God decide to dwell among sinners like us? Why did He leave home? If Christ were to be man’s substitute and give His life as a ransom, He had to be true man. Sin had destroyed the human relationship with God. Our guilty thoughts, words, and actions divided us—separated us from the One who created us. Our rebellion against God would only yield death and hell. We needed a Savior that could be our substitute. We needed a Messiah that would willingly give up his life in our place. As true man Jesus suffered on the cross, died, and was buried. When He breathed His last breath and the soldier put the spear in His side, death had come, Jesus – true man died on that cross. But if that baby born in Bethlehem and wrapped in swaddling clothes was only true man, His sacrifice would have been for nothing. And so, we learn that the virgin gave birth to a son and His name was Immanuel – God with us. Jesus was not just a little baby boy in that manger, Jesus was true God…God with us and among us! Peter’s confession of faith in Matthew 16:16, is our confession of faith: “You are the Christ, the Son of the living God.” There is no reason to doubt the truth of the fact that Jesus was and still is true God. The evidence of Jesus’ divinity is boldly revealed in the Bible. Jesus humbly and obediently left His home in heaven and made His home here on earth. His first night in this world offered Him nothing more than a lowly food trough for a bed. How humiliating that had to be. Jesus’ humiliation was the way in which He lived on this earth – the manger, the poverty, the servant’s lifestyle. As we gaze at the babe in Bethlehem during this Christmas time of year, we take comfort in knowing, by faith, that Jesus, became our brother. We can think about and remember Bethlehem all year long because Christmas is so much more than just a holiday and a day off of work. Jesus left His home in heaven to dwell among us so that we might live with Him free and forgiven – Forever! Jesus was not home for the first Christmas so that one day we can go to be home with Him for all eternity in Heaven. It might be nice to be at home with family during the holidays. But we know, by faith, that we are never really at home while on this earth. Because of what Christ did for us, we know that we are sojourners and pilgrims here on earth…Heaven in now our home. I pray that the Lord will bless each of you, your families, and the souls you have been called to serve!